System installation represents Phase 3 of our four-part air compressor system service. For many, this is the most crucial element. 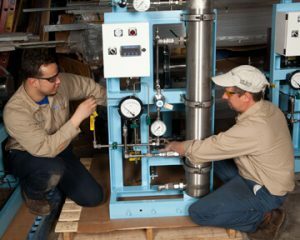 Once you have analyzed your needs and designed and fabricated your air compressor system plan, all that you need to get started is the equipment. The installation of air compressor equipment is one of the things we do best — as well or better than anyone else. We are proud to be able to offer our on-site installation services to you and your business. What Is the Purpose of Our System Installation Service? The purpose of your system installation service is to get your air compressor system up and running the right way as soon as possible. We not only provide complete installation services such as material acquisition, rigging acquisition, mechanical and electrical services, and more, but we also offer complete start-up services like setup and calibration, operational guidelines, and on-site start-up and shutdown. How Does Our System Installation Service Help Businesses? Your air compressors and related equipment cannot help you if they are not installed correctly. But equipment installation is not necessarily your company’s area of expertise. Thanks to The Titus Company, it doesn’t have to be. We’ll take care of everything and show you all you need to do to operate your great new air compressor equipment. What Are the Benefits of System Installation Service? When you hire us for an air compressor system installation, you’ll enjoy a turnkey solution for your business. Our highly trained technicians will show up in fully loaded trucks with all the latest tools and parts we require to set up your system and go right to work. We will work quickly and efficiently and leave you with a perfectly functioning air compression system. Before we go, we will test everything and offer onsite training on all of the equipment to make sure we leave you with a system you know how to operate. Installation is the culmination of our air compressor system program. We’ve provided you with the best equipment, analyzed your needs, helped you come up with the perfect design, and now the installation is where you get to see it all pay off. Why Choose The Titus Company for System Installation? Hopefully, you have trusted us to provide you with the high-quality air compressor equipment your company deserves and have allowed us to design a system where it can function most effectively. After all that, the only way to be truly confident you will get optimal use out of this equipment is to let us install it. By this time, we know what equipment you are using and what you need it for. We’ve taken the time to get to know your business and how we can help. Why not let us finish the job with expert installation, performed quickly, and in a budget-friendly manner? At The Titus Company, we know air compressor installation — and you can be confident we will not leave until we are sure your system is ready to operate at peak efficiency. To get started, please contact us today.